A call to consider saving a doomed £24million school site from years of debt – by demolishing a community centre and switching its services - has not gone down well with Gazette readers. South Shields businessman Colin Campbell believes flattening Chuter Ede Community Association could solve the problem of what to do with South Shields School, which is due to close next year. Under his plan, the community centre – a former school in Galsworthy Road, Biddick Hall – would be flattened and its considerable land assets freed for revenue-raising housing. At the same time, he says, its services would be moved to the South Shields School site – around a mile away in Nevinson Avenue, Whiteleas, which could then operate as a community centre. Mr Campbell says this would satisfy the terms of the Private Finance Initiative (PFI) funding deal under which the school opened in September 2011. The contract states the under-performing school, which councillors have voted to close in 2020, can only be used for educational purposes, limiting future operational opportunities – and costing the council millions of pounds in repayments. 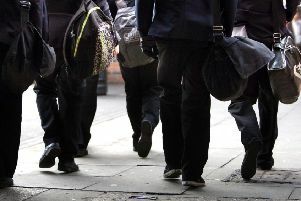 South Tyneside Council is obliged to pay towards the upkeep and maintenance of the school, at an estimated cost of about £400,000 a year, until 2036. Readers were quick to take to our Facebook page with their views. Neil Downey wrote: “The sale of the land from Chuter Eded would help pay towards the council’s costs for the school and help them save money by maintaining the the site.